What has decades of new rhinoplasty techniques taught us? A tremendous amount. We have learned about how to create a nose that fits the face. We have learned how to create a nose that functions well. We have learned how to get people to heal faster and get back to work earlier. We have learned how to minimize the chance that we will have to do a “touch up” later on. The New Nose is not a dramatic shift from the past. It is a nose that is focused on looking natural, and not having any pointy areas. It is focused on not turning the tip up too much. It is focused on not “scooping out” the nose too much. All of the above can make the nose look fake and unnatural. Smooth contours and appropriate size of the tip are keys to the procedure. Also, as the effects of improved sleep and exercise are more and more evident as time passes, rhinoplasty surgeons have become more and more sensitive to making sure the nose can function well. I performed a study that looked at rhinoplasty patients (over a 7 year span) that was published in the JAMA Facial Plastic Surgery Journal last November which shows that using certain techniques, we can improve breathing in rhinoplasty patients consistently. 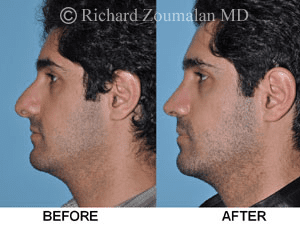 Rhinoplasty is an art and a science. I have published over 40 research studies and book chapters on Facial Plastic Surgery, and about half of those have helped advance the field of rhinoplasty. There is a tremendous amount of literature on rhinoplasty, and more and more is learned by the year. This has helped shaped my approach to create the best result for the patient.